After a long winter, the Weekly Weeder series has finally thawed out. I've caught up with enough of my gardening to make time to snap photos of some more of the wild plants around my area (northeast Wisconsin), and would like to share them with you! Today’s featured plant is Marsh Marigold, Caltha palustris. 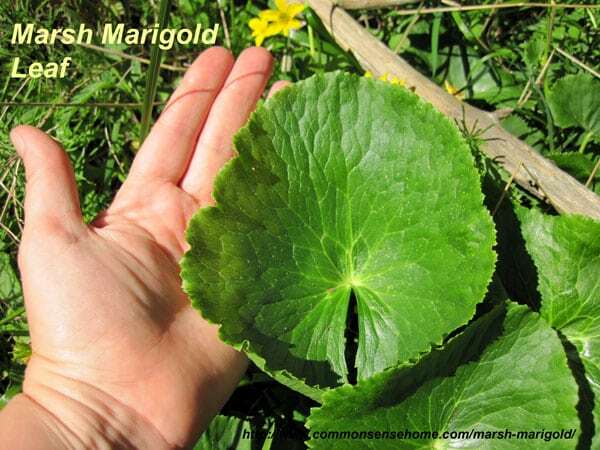 Marsh marigold is also known as yellow marsh marigold and cowslip. It is a member of the Family Ranunculaceae or Buttercup Family. It should not be confused with Primula veris, which is also commonly known as cowslip, which is a member of the primrose family, Primulaceae. Marsh marigold is native to North America. It can be found throughout Canada, even into the arctic reaches, and in much of the northeast United States and along the West Coast. (see map). As you would expect from the name, it prefers wet soil in swamps and marshes and along lakes and streams. Many woods in our area are filled with these bold flowers in early spring, lighting up the dappled forest floors. 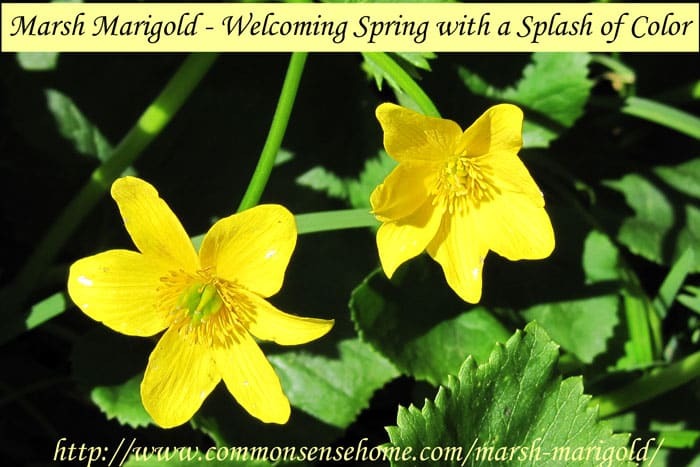 Marsh marigolds are perennials, coming back year after year, so once you've identified an area where they grow by their abundant flowers, it's easy to come back in early spring to catch them at the best time for harvest before the buds open. Marsh marigold flowers are a lovely bright yellow. They have 5-9 “petals”, which are actually sepals that are 1-1 1/2″ (2.5 – 4 cm) wide. they look like large buttercups. As the season progresses, they produce green, starlike fruits. You can see the green center of the blossom in the left flower of the top photo. Since they are some of the first flowers of spring, marsh marigolds are much welcomed by pollen and nectar eating insects such as bees and flies. Our patches were also swarming with mosquitoes, but I'm quite sure that was simply due to all the standing water in the swamp. I was under siege as I was trying to get photos. The nectar and pollen of the flowers attract flies and bees primarily. This includes Bombylius major (Giant Bee Fly), Syrphid flies, Halictid bees, honey bees, and others. Two leaf beetles are occasionally found on the foliage of Marsh Marigold: Plateumaris nitida and Hydrothassa vittata. It is possible that they eat the foliage. 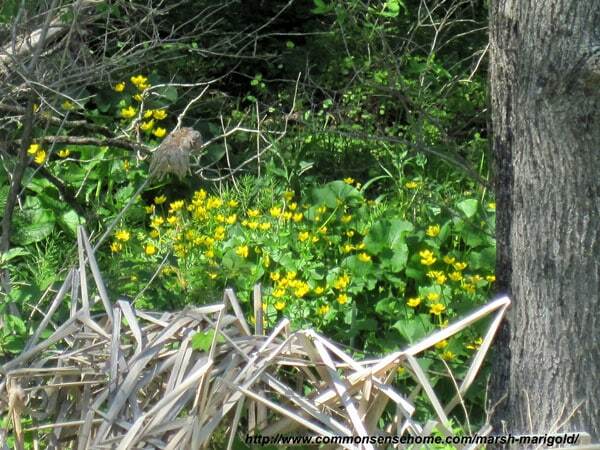 For other herbivores, specific information for Marsh Marigold is lacking. Because the acrid foliage contains toxic alkaloids and glycosides, it is usually avoided by mammalian herbivores. The seeds of plants in the closely related Ranunculus genus are eaten by the Wood Duck, Sora Rail, and some upland gamebirds. The seeds of such plants are also eaten by the Meadow Vole, Eastern Chipmunk, and other small rodents. Marsh marigolds are featured in The Forager's Harvest, but they're not exactly enthusiastically recommended. Biggest plus – they are easy to identify, and one of the first greens of spring. I remember church members picking cowslip flowers by the basketful for the kids to carry on Mother's Day for First Communion. This year they ran a little late because our winter was so long and cold, so I snapped my photos at the end of May, but they are usually blooming in early May. The best time to harvest them for food is before they bloom. The buds can be vinegar pickled as a caper substitute. In The Forager's Harvest, the author suggests cooking the young leaves and/or buds for 20 to 40 minutes in one or more changes of water. He uses three changes of water, and cooks the beejeezus out of it, until it turns into green goo he refers to as “green pudding”, which he serves with salt and butter. The Foraging Family cooked their green goo up with Indian spices and coconut oil to make it into a sort of dahl, and found it more palatable. I haven't tried it. Honestly, I'm not that hungry – but it's good to know we could eat it if we needed to. I don't know about you, but that description doesn't exactly want me want to run out and experiment with it. I think this is one plant best left to the herbal experts. As always, any medical information is for informational purposes only. Always exercise caution when using any wild plants and make sure you have positively identified the plant. This plant is pretty straightforward and doesn't hang out with truly dangerous plants that look similar, but being careful is good. You may also enjoy other posts in the Weekly Weeder series. Marsh marigolds might be best enjoyed by wildlife and for their beauty, but there are many great weeds out there that are tasty and are useful for medicine. Many of our “weeds” were carefully brought over by colonists at various times because they were very useful plants. Mountain Rose Herbs stocks many hard to find herbs and seeds, containers and other ingredients. Forage locally, check with local merchants, but if you can’t find what you need for all things herbal, these folks are a good resource. Typically when a plant is recommended as a wart treatment, either the sap is applied or the plant in smashed and used as a poultice.